This class was weeks ago and I tweeted the statement because I wanted to remember it. I remember it. That fact owes some credit to the number of people who responded to the tweet. I have often responded to my colleagues’ complaints with empathy because we are all in the same boat. I get their frustrations (or at least I think I do or try to do so). But I haven’t gone a step further to think about the bigger message behind the complaints. Most of the time, when we complain we are using that as a coping strategy, I think. Complaining is a way to handle the stress or frustration or anger or sense of helplessness. I don’t think we are often aware that our complain houses a request. At least, I know I’m not consciously aware of it. In the past few weeks I’ve become more aware, after hearing this in class. 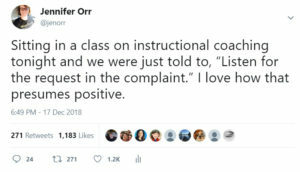 As the listener, having empathy for the complaint as well as hearing the request is an amazing thing to be able to do. Many of the folks who read the tweet read it with a different lens (as I am inferring). They thought about the request in student complaints. I hadn’t considered that perspective and it fascinated me. I’m so glad for the responses that helped me consider that as well. If we, as adults, are struggling with recognizing that our complaints really couch requests, it would be absurd to think that children recognize that. So thinking about their complaints as containing requests is quite intriguing. Listen for the request in the complaint. That’s a new goal for me – for my own complaints and for those from others.